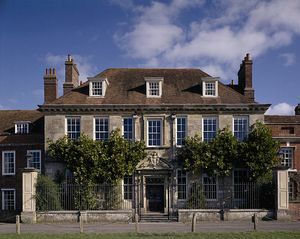 Sharing the Close in Salisbury with the magnificent Salisbury Cathedral overlooking the Choristers' Green, the grand Mompesson House with its Queen Anne facade looks quite at home in this quiet backwater of Old Sarum. 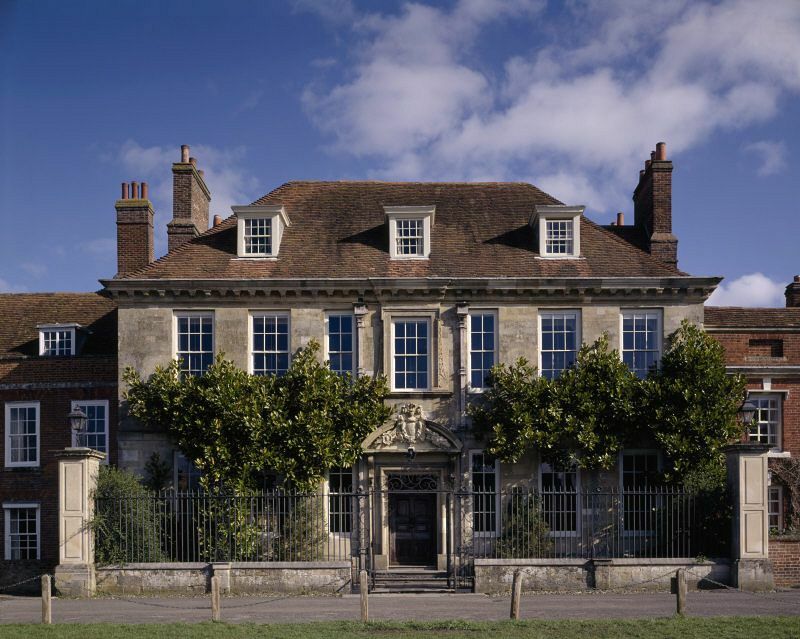 The house was built in 1701 for Charles Mompesson who was the Member of Parliament for Salisbury at that time. 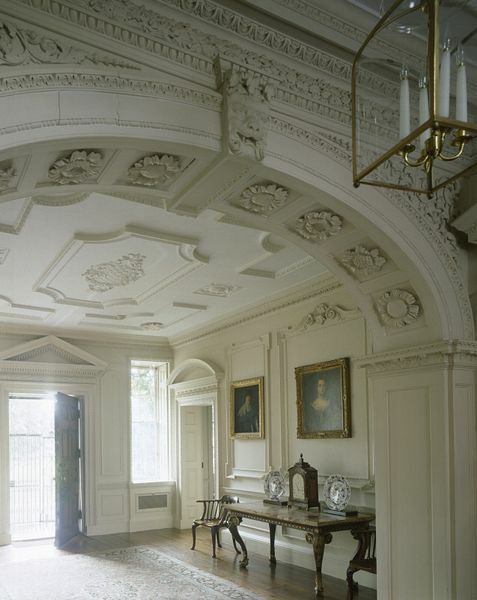 Built of grey Chilmark limestone, to match the Cathedral, the house hides behind two huge magnolia trees whose fragrant white blooms add to the authentic period setting. 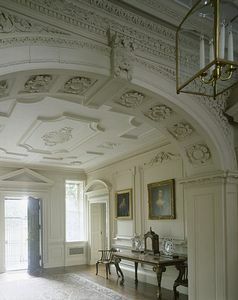 was saved for the fine oak staircase hall where an array of flowers, fruit, masks and even the head of King Midas peer down from the ceiling in splendid detail. Carved heads are the theme throughout the plasterwork in each airy room and children of all ages can have fun spotting them - there are over 40 altogether! Mompesson House has been staged to bring history to life. The table is set for dinner and the ever-changing exhibitions highlight unique insights into "life in the big house" during the 18th Century and 19th century. One such exhibition is a collection of over 370 English drinking glasses in the Turnbull collection. The designs etched upon the different glasses give a clue as to what they were designed for - apples for cider; hops for beer or barley for malt whisky. tiny lady wrapped in layers of shawls, continuing to sketch and paint until she died, aged 96. 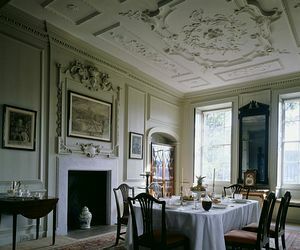 The house was bequeathed unfurnished to The National Trust in 1975. To see the genteel drawing rooms, library and bedrooms which are now appropriately decorated and filled with antique treasures is a credit to the work done by the trustees of the house. The Queen Anne needlepoint chair, mother-of-pearl table and rare embroidered samples on the walls add to the period atmosphere of this family home. Some points of particular interest include the false doors on the end wall of each bedroom, designed to give the illusion of the house being much larger than it actually is. Visitors may recognize the bedrooms from scenes of the film "Sense and Sensibility" which starred Kate Winslett. The last room of interest is the tiny privy in the corner of the garden behind a yew tree. An ornate stone doorway leads to a panelled toilet which once emptied straight out into the back lane! Finally, stroll to the carriage house and enjoy tea and cakes in the walled garden, giving the whole visit the feel of stepping into an Anthony Trollope novel, set in mythical Barsetshire. On north side of Choristers' Green in the Cathedral Close, near High Street Gate. Wilts & Dorset buses from surrounding area.